kokaquilts: changes & a bit of "print mixing"
After much deliberation and discussion, Julie and I have decided to stop hosting Sew, Stitch, Snap, Share our fortnightly linky party. Lifestyle changes, time constraints, and a drop in numbers linking up have all contributed towards this decision. Over the past year we have been hosting this, we have been continually amazed and inspired by the creative quilters and stitchers who have linked up each fortnight. Thank you all for linking up over the past year or so, it's been great to see such a variety of projects. Here are a few photos of what caught my eye as I was reflecting back today. 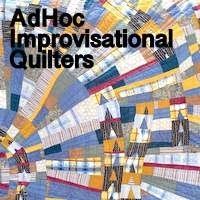 First up - a little mix from kiwi & auzzie quilters . . .
'sweet surrender' made by Gretchen from gretchenslittlecorner. 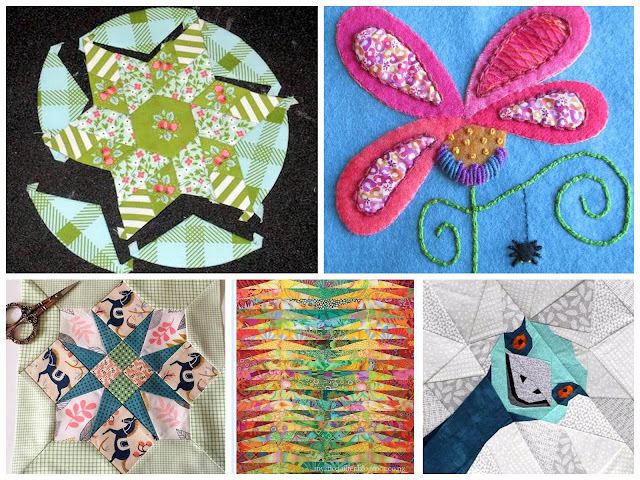 and another collage mix from various quilters around the world . . .
for supporting us and sharing your work with us and other readers. Blogger's current nightmare is also certainly frustrating just now. 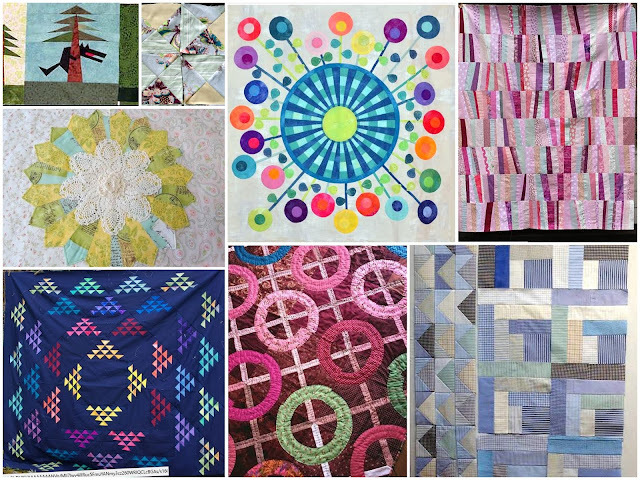 Judging from the drastic drop in blog post readership, comments and postings, I think many quilters are quietly concentrating on other creative outlets. For me, blogging will continue to be my preferred choice of social media . . . at least it helps keeps the momentum going! If you comment on any of my posts and have a profile with email addy, I will get back to you! Onto what's been happening in my sewing room this weekend. 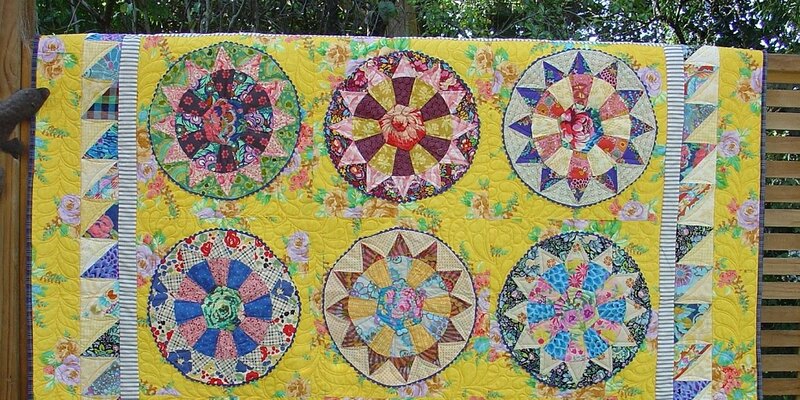 I'm still making more 'star crossed' quilt blocks. I'm "print mixing" combining 'love story' fabrics by Maureen Cracknell with other prints from my stash. Linking up with Cynthia for 'oh scrap' here. Oh, and one more thing before I go . . . here in NZ we're moving very quickly into winter, I love this time of the year! Lots of homemade soups, long beach walks all rugged up warmly, matariki celebrations. And again this year in Auckland 'Give a Kid a Blanket' is running it's winter collection right now if other #kiwiquilters (or knitters/crochet) are interested. For more details & drop off points check out this link here. Sorry you decided to close the linky. I linked up a couple of times, but I could never remember which week it was going live. Love your scrappy projects. Enjoy the cooler temps and the seasonal activities. It's full blown summer here. Making that 1st comment, hopefully other I'll get notification of any others! I always enjoyed your party so I am sad to see it go! But I will still catch up with you on your blog. I always love to see what you are up to. Thanks for linking up to my party over at Oh Scrap! Sorry to see your linky disappear but totally loved the retrospective and I'm thrilled that you are going to keep blogging. I too fear that bloggers may be disappearing but I hope that there are always enough to keep a quilt blogging community alive - love the inspiration and the stories that go with it. Blogging IS my social media. I post on IG but only for the sake of images. Stories and process belong on the blog. Happy you are going to continue posting. I've joined the link up a few times but tend to forget to cross-post. Good for the two of you for re-focusing your energies. I wasn’t able to laeve a comment over at Julie’s blog. I want to thank the both of you for hosting the Linky party. I didn’t link up every fortnight, but loved to see what other bloggers were working on. I post on IG and Facebook, but I will keep on blogging to save details about projects and stuff going on in my life. I will be here and over at Julie’s to read and enjoy your blog posts! Thank you for hosting the linkup for as long as you did! It's a lot of work and the time commitment can be problematic at times. You've drawn a very interesting group of readers together which was fun while it lasted. Love your work and am so glad that you will continue to keep blogging. Your blog is one of my favorites to see pop up in my reader app! 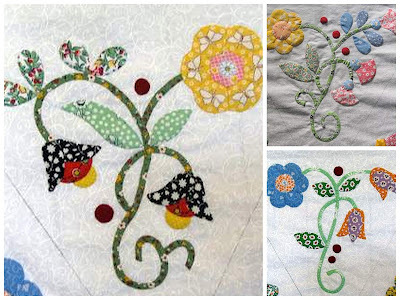 I'm so sad to hear "sewn snap stitch share" is no more and apologise for not being a more regular contributor. Thank you for hosting this link - it was fun to see what peeps were up to. Glad you're still blogging and love your blocks. Farewell stitch, snap & share! I was one who only contributed a couple of times.......but I always read the posts. Good to see some pretty piecing from you. Keep warm and enjoy those yummy soups. Thanks to both yourself and Julie for hosting the link-ups. Sadly I didn't link up as often as I should have liked, for various reasons. 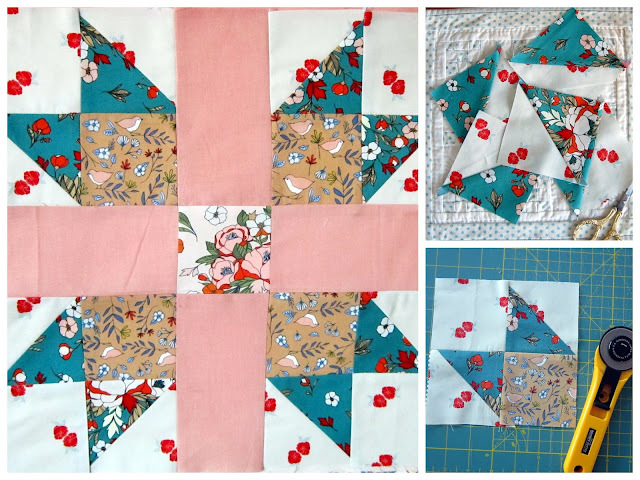 Blogger is causing a few headaches at the moment but blogging is my preferred way of keeping in touch with quilters around the world, reading about their inspiration, process and their finishes! Hope you're going to keep on blogging Linda! try something else. Kind of like piecing and design. I enjoyed your link up, thanks for hosting with Julie. It is a commitment and life does get in the way. I enjoy your work and I'll continue to visit. Love seeing the star crossed blocks. Enjoy your Winter celebrations and events. I'm sorry to see the linky party go, too. I didn't join up as often as I should have, but I always enjoyed seeing what everyone was up to. Blogger certainly caused a bunch of headaches! I worked out how to fix the comment notification problem - I did a post yesterday. Somehow I managed to miss this post. A feast for the eyes! So many gorgeous blocks including your current project.